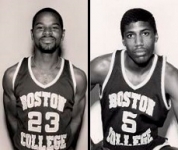 The 1984-85 Boston College Eagles finished 6th in the Big East Conference, but in the mid-1980s the Big East was king in college basketball, sending three teams to the Final Four in 1985. 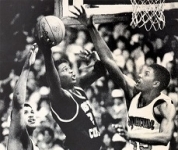 Coached by Gary Williams and led by the likes of Michael Adams (#23 below), Roger McCready (below left) and Dominic Pressley (#5 below) the Eagles No. 11 seed in the Midwest Region. After a first round win over Texas Tech, BC faced No. 2 seed Duke. One year later the Blue Devils would advance to the NCAA Championship game, but on this day it was the Eagles that prevailed 74-73. 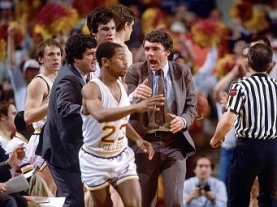 Turn back the clock to 1985 with head coach Gary Williams as he remembers the Boston College Eagles.